Many companies offer matching gift programs to encourage employees to contribute to charitable organizations. Some even provide matching funds to support employee volunteer hours. Most of these programs match contributions dollar for dollar, and some will even double or triple the amount of your gift! Some also match gifts made by retirees and/or spouses. Examples of companies that participate in a matching gift program include Progressive, Key Bank, PNC, Sherwin-Williams, Ohio Edison, General Electric, East Ohio Gas, WKYC, Lubrizol, and many others. Check with your employer to see if they offer a matching gift program and maximize your impact for PetFix. Renewing your vehicle registration and getting new plates? 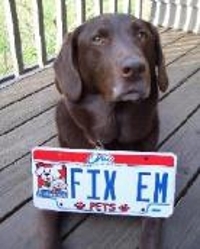 PetFix is a proud supporter of the Ohio Pets Plate. Pet license plates raise funds for education, spay and neuter of pets for low-income families, and for dogs and cats adopted from qualifying agencies. For more information, click on the pet plate in the photo to be directed to the Pets Ohio website. PetFix Partners schedule the PetFix Transport Van to come to secure, convenient locations within their service areas on a regular basis. They advertise surgery dates, schedule clients, and collect fees. PetFix is pleased to be working with a new partner, Neighborhood Pets Outreach and Resource Center in Slavic Village to offer affordable, accessible spay/neuter surgeries to low-income pet owners in the city of Cleveland. The goal of Neighborhood Pets is to help owners retain their pets, while keeping them happy and healthy, which in turn will reduce intake numbers at Cleveland Animal Care & Control. By working with reliable partners, PetFix is better able to reach out to targeted populations in underserved areas without access to low-cost veterinary care and/or with high shelter intake. If you are a community organization, animal welfare agency, business or individual interested in learning more about being a PetFix Partner, please contact us at director@petfixnortheastohio.org. Together, we can reach more people and fix more pets.